Chefs from Atlanta always seem to represent their city well on the show Chopped. With his creative style and imagination, Chef Zeb Stevenson should definitely be added to the growing list of talented chefs from the area. We caught up with Chef Zeb (@the_chef_z) after his victory this past Tuesday night. ZS: I started as a dishwasher 15 years ago. I knew at that point that I had found my way into the right business. I had worked many other kinds of jobs before that (factory, construction, retail etc. ), but working in a restaurant was unlike anything I’d ever done before. It felt “alive.” The change was invigorating. You see, in previous jobs the work was not only repetitive but it failed to provide any level of intellectual stimulation. There was no creative outlet. Cooking provides me with the means to satisfy my creative side and the ability to gauge the effectiveness of my efforts in real time. FP: Your creativity certainly came through on Chopped! ZS: Marco White: Talk about a working-class guy who pulled himself up by the bootstraps! He was the first true Rock & Roll chef! Jean-Louis Palladin: He was “the” master of execution. Period. Grant Achatz: Not so much for the experimental/avante garde techniques; there’s something much deeper than that to his cooking. He cooks with a profound sense of aroma. He honors and elevates the idea that eating can and should be a multi-sensory experience. ZS: Hurry up and wait. From beginning to end – that’s pretty much it. I enjoyed the other chefs once everyone got over their nerves and opened up a little bit. My competitor in the dessert round was nervous and asked me to tell her a story to distract her. I told her a story from my childhood about my dad and his friends butchering a cow. I don’t think she liked my story. At any rate. . .Would I do it again? Nope. FP: Your motivation to win was really touching. Have you had the chance to go to The French Laundry with your wife? If so, tell us about the experience. ZS: We went to French Laundry on April 5, 2012 exactly one year from the day that she was diagnosed with cancer. I’m pleased to report that it was an amazing experience. Some of our experiences with three Michelin Starred restaurants have been a little sterile and disappointing. Don’t get me wrong, the food has always been executed perfectly and the service has always been flawless. Then again that’s simply the expectation at that level. French Laundry was all of those things and fun, too. The staff made us feel like we belonged there, like we were special. FP: Sounds like a great experience. We’re so glad that you were able to fulfill that promise to your wife! When you are home, what are some of your favorite meals to cook? If you go out to eat, name some of your favorite places in Atlanta or other cities you’ve visited. ZS: Our meals at home are not what you would expect from a chef. Between my wife’s condition and the fact that I am an endurance cyclist, we tend to eat very healthy meals. We typically cook grass-fed/pastured proteins with fresh vegetables and healthy fats. We don’t eat cereal grains or added sugars and we limit our intake of dairy. We go out to eat pretty frequently. We love Empire State South, The Optimist, Miso Izakaya and One Eared Stag. I’ve been known to patronize the ethnic restaurants up on Buford Highway quite a bit, too. As far as other cities go. . . our two most memorable meals as of late have been at Edi and the Wolf (NYC) and Bar Tartine (San Francisco). FP: We’ll have to check some of those places out, especially the ones in Atlanta! Such a great city! ZS: I eat a lot of beef jerky. I stuff it into my jersey pocket and eat it while riding my bike. FP: Name three individuals you would want to invite over for dinner and what you would prepare for them. I’d roast a whole lamb and serve plenty of funky French Old-Vine wine. ZS: I’m not sure what I would be doing. It really doesn’t feel like there is any life outside of the kitchen for me. Obviously cycling is my number one activity outside of the kitchen. I also play bass guitar and roast my own coffee. FP: Half of Foodie Pleasure would love to give your coffee a try! 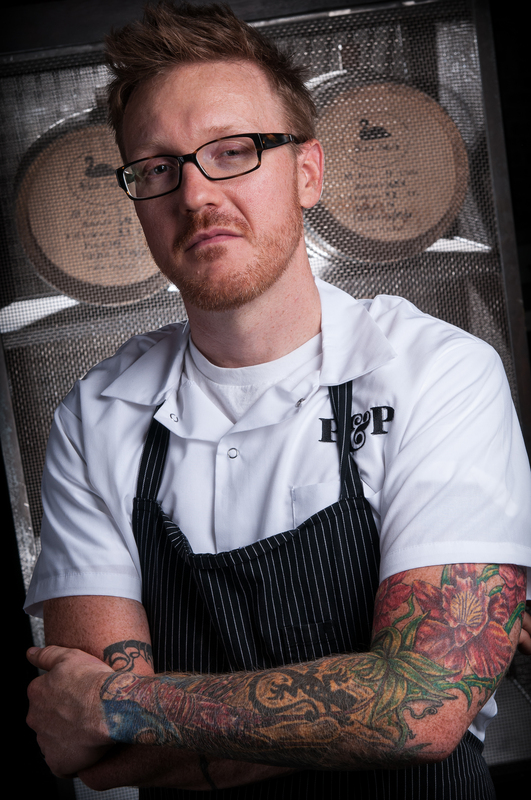 Where will we see Chef Zeb Stevenson in 10 years? ZS: Hard at work fulfilling my dream of making people happy and mentoring the next generation of chefs. Hopefully, I’ll be signing the paychecks at that point. FP: We have no doubt you will succeed in all your future endeavors! Thank you so much for your time.